This morning I decided to add a new feature to my blog - an end of the month review of my creative projects, just a simple wrap-up list of what I've completed during the month. And then as I was surfing around the blogosphere, I was inspired by Sue's post and S's post to include a preview of the upcoming month. Here's the last layout for the month that I completed earlier today. 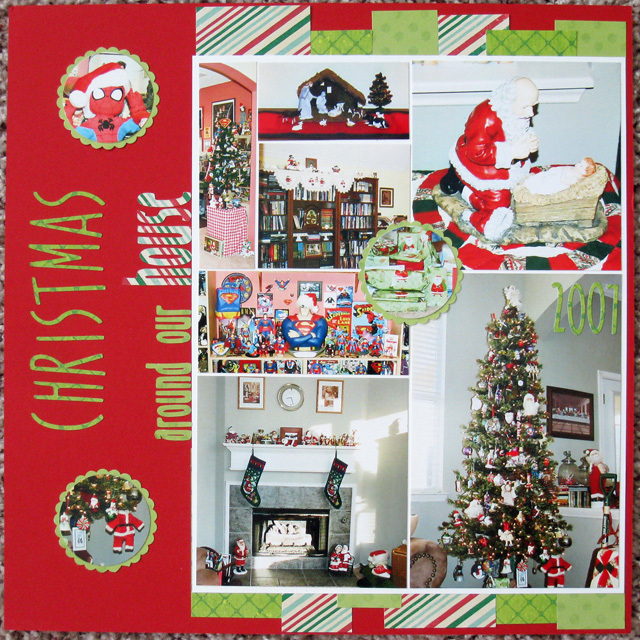 It's a two-page layout and all the materials are from a 2007 Stampin' Up Just Delightful Simply Scrappin' kit that I picked up for a couple of dollars at a flea market back in December. The January 13 weekly challenge in the Library of Memories Community was to browse through our oldest storage binder and clean out photos. I'm working on my early 2008 storage binder; it's not the oldest datewise but it was the first storage binder I filled up when I began the LOM system last year. 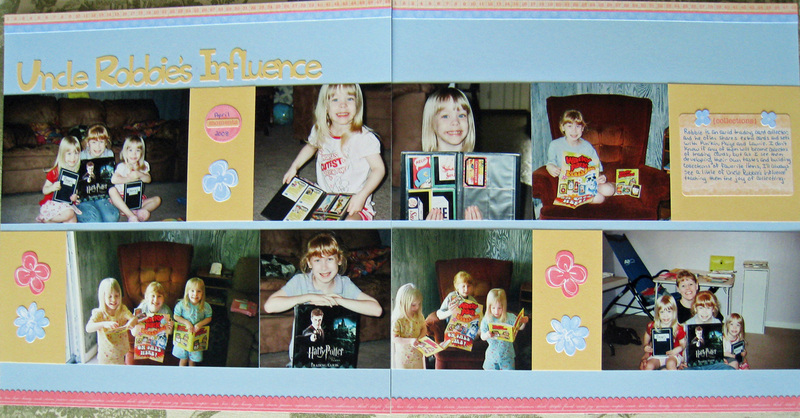 The inspiration for this layout came from this post at Get It Scrapped! Journaling reads: Robbie is an avid trading card collector, and he often shares extra cards and sets with Pun'kin, Paige and Laurie. I don't know if any of them will become collectors of trading cards, but as I see them developing their own tastes and building collections of favorite items, I'll always see a little of Uncle Robbie's influence teaching them the joy of collecting. *I'll be continuing my Healthy Living Weekly Posts on Fridays and will publish a Sunday Musings post most weeks. *I am excited to once again have a spot as a Guest Designer for an upcoming Sketches in Thyme Thursday Takes sketch challenge - watch for that post on February 10. *I hope to complete each week's LOM Community challenge. 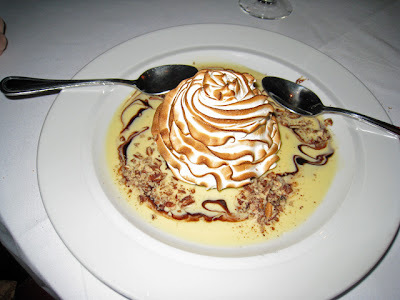 Thanks for stopping by - hope to see you again in February! My sister posted her completed blue quilting projects last weekend, so I decided to finish up the month with a couple more January Blues layouts. I had a wonderful note that Pun'kin Natashia left on the guest bed after one of her visits, and I really wanted to preserve it on a layout. I mounted the note on blue cardstock, used my scallop punch on a photo of Natashia from that visit, picked some miscellaneous blue letters for a title, and completed a quick simple layout. 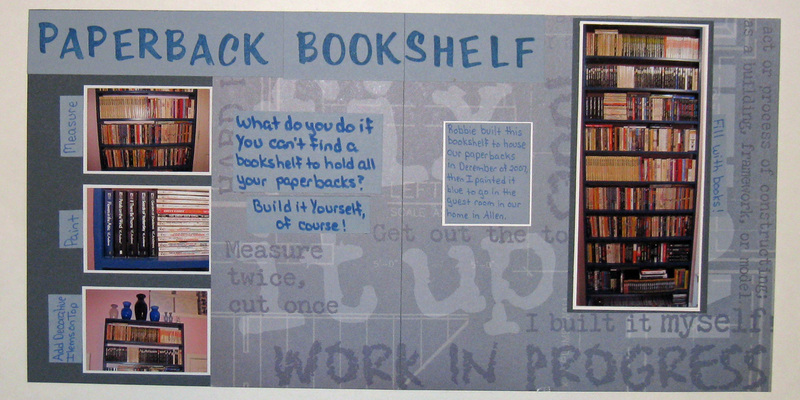 Then I created a two-page layout for our 8x8 Do It Yourself album, this one featuring the paperback bookshelf that Robbie made several years ago. I started with a 12x12 patterned paper from Karen Foster Design aptly called "DIY Construction." 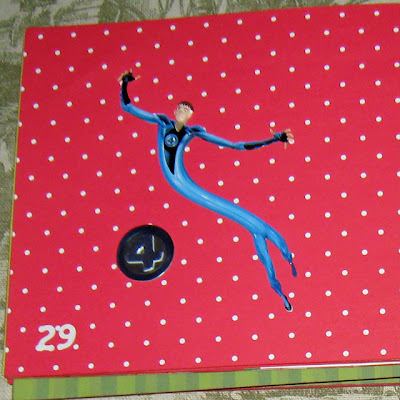 I cut one 8x8 piece and one 4x8 piece, then added a solid blue cardstock to complete the background for the 2 pages. I pulled several strips of matching cardstock from my scraps file for the title and journaling and used an old set of Rubber Stamping Ideas alphabet stamps for the title. 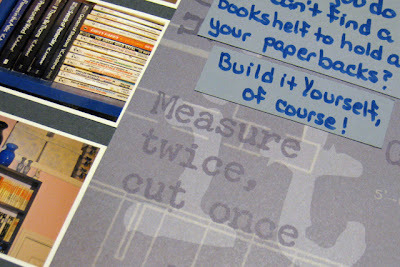 I really like the way this patterned paper adds to the DIY theme of the layout. I don't know yet what February's color will be, but I've enjoyed making these blue layouts and can't wait to try a new color next month. 2. 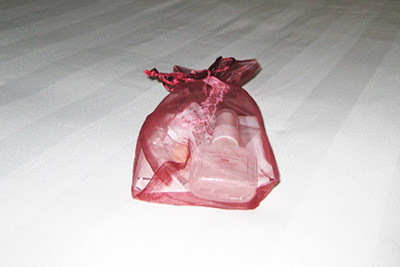 Little extras in cute packaging. 3. A nice place to sit and read. 4. A full room service menu. 7. 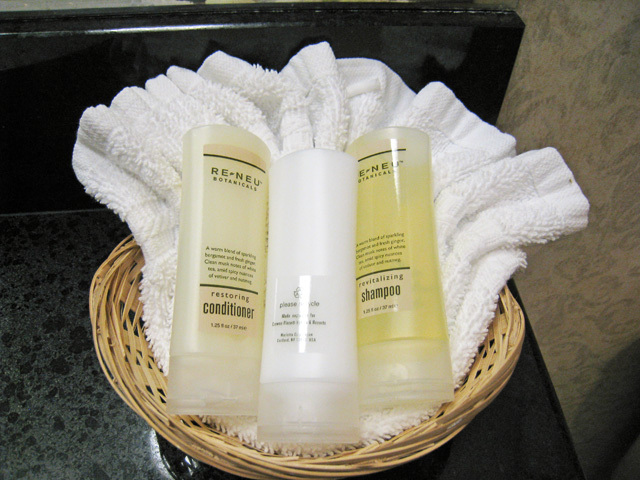 Little baskets to hold amenities. BONUS: Nearby restaurants with scrumptious desserts. A week or so ago, I saw this on Mel's blog and was lucky enough to be one of the first five to comment. I really like the idea and am excited to pay it forward. I promise something handmade to the FIRST 5 people who leave a comment here specifically stating they want to join in the Pay It Forward fun. The original "rules" state that you must repost this status, offering something handmade by you to 5 other people and it must be sent to your 5 people some time in 2011, however I am not requiring this. If you would like to repost this and offer something to your readers, that would be lovely, but feel free to enter even if you do not have the time/money/desire to pay it forward at this time. When I know which of you will be receiving something, I'll contact you to check a few details, look at your blog to get an idea of your tastes and interests, and create something especially for you. I can't guarantee quite how quickly I'll get the items in the mail (luckily the rules say sometime in 2011), however my plan is to get something out by the end of February. You have been TAGGED and want to participate? 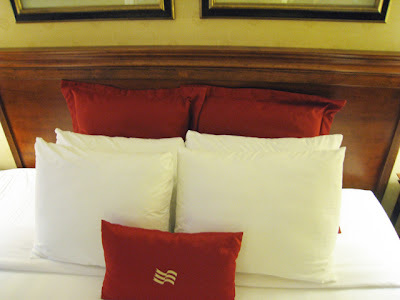 Then create a post where you post the 'LOVE BLOG' image. You should also blog the persons link that gave you the award and inform her/him that you accept the award.You can then choose 3 - 5 favourite blogs which you also link in your post, then each blogger will inform you that they have been tagged. Please note: The aim of this action is that we bring unknown, good blogs to light, so I was asked not to blog fellow bloggers that already have 3,000 followers. Again, I am not adding this requirement for those I'm passing the award on to; that choice is up to the recipients. BTW - don't you just love how the Internet allows us to "know" and receive awards from people all around the world. Remember, the first five people who leave a comment here specifically stating they want to join in the Pay It Forward fun will receive something made by me especially for them. Ready, set, GO!! 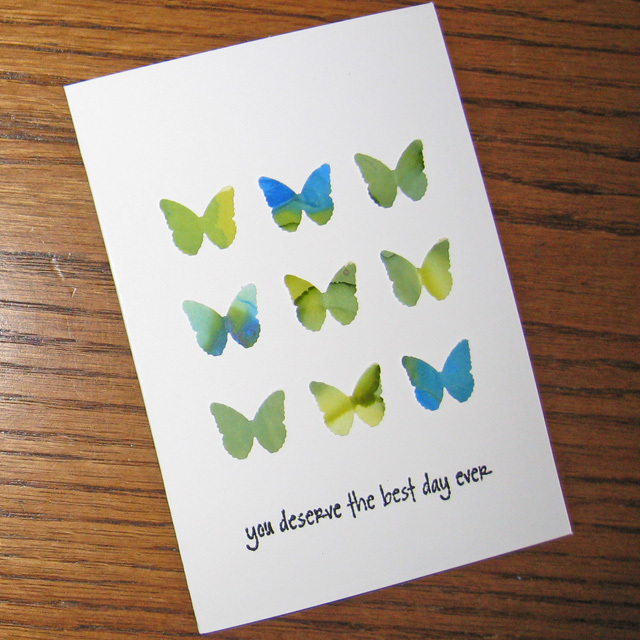 I am so excited that I was chosen as the Card Cupid of the Week for the Valentine's cards I sent in to Card Cupids. I've started working on my February cards this week. 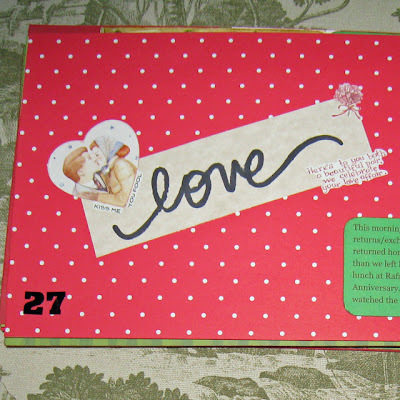 I need three birthday, two anniversary, and several Valentine's cards for the month, plus I plan to make and send a few more Valentine's cards to Card Cupids before the February 4 deadline. So far, I've completed two of the birthday cards I need for February. For these cards I used this Card Patterns sketch from the Sketches in Thyme Tuesday Takes #9 sketch challenge. I started with a piece of brown cardstock and punched a border along the bottom edge. 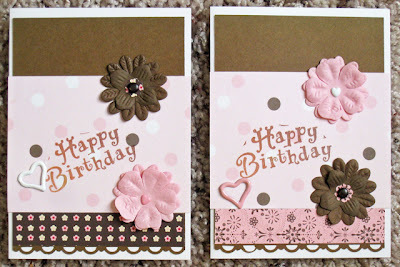 I added stips of two patterned papers, two flowers with brad centers and a heart brad to each. Then a simple Happy Birthday stamp to finish them. I must start this post by saying that the massage I had planned to reward myself with once I reached 160 pounds was WONDERFUL! It really seemed to reinforce the fact that I have made changes in my lifestyle over the past several months. 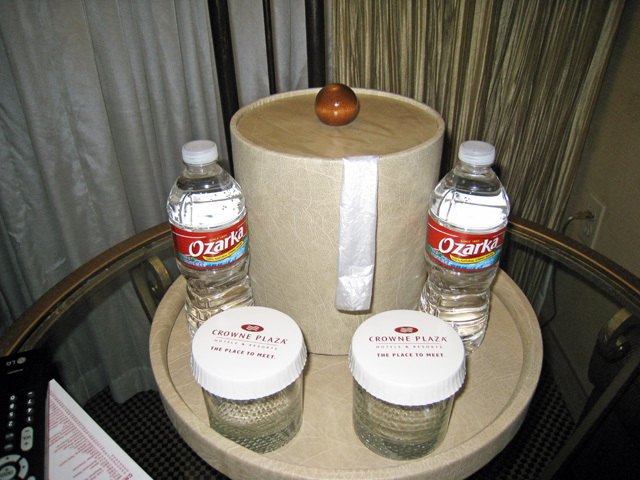 I have decided that another massage is in order once I reach the 150 pound mark, whenever that may be. I'm not really focusing on losing a certain amount of weight right now, just making the changes necessary to life a healthy lifestyle. But I know that if I continue eating healthy food and proper portions and continue exercising regularly, I will continue to lose weight. This was a good week healthwise, I exercised & ate fairly healthy most days. As a side note, yesterday one pair of my pajamas bit the dust. The elastic in the pants had been stretched out and now that I've lost some weight, they are too big. 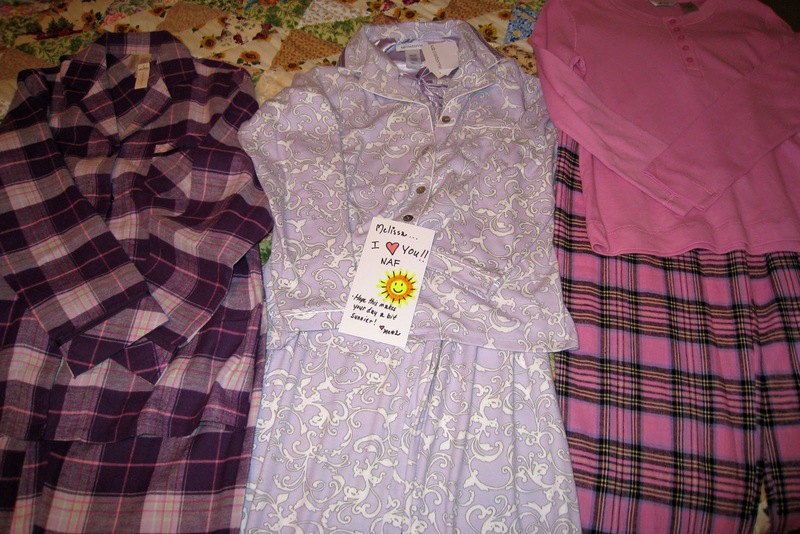 Plus they are about nine years old and were becoming rather faded and one button was missing from the top. (Even though I'm not purchasing new items for my scrapbooking stash right now, I can still recycle items, so I'm adding the remaining lavender buttons and a few squares of material to my stash!) 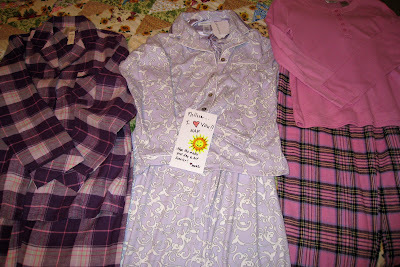 While I was out getting my massage, Robbie snuck to the store and bought me three new pairs of pajamas and had them arranged on the bed with a sweet note when I arrived home. He said they were just another reward and reminder of my success so far in my quest for healthier living. 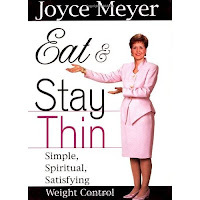 This past week or so I read through Joyce Meyer's book Eat & Stay Thin . 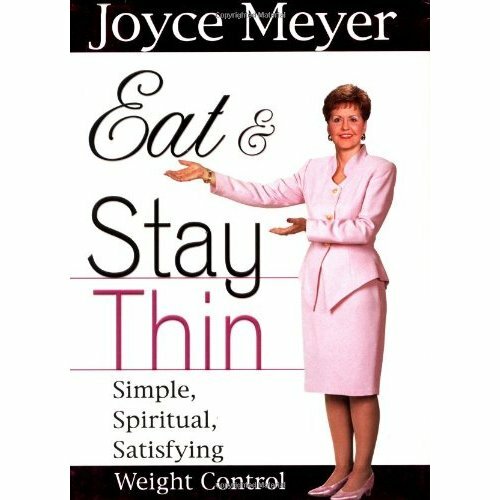 It is a short book that briefly discusses twelves reasons people overeat: lack of knowledge, lack of a balanced diet, lack of exercise, bad eating habits, unbalanced metabolism, spiritual unfulfillment, emotional unfulfillment, loneliness, loss & boredom, preoccupation with food, impulse eating, passive eating, and lack of self-denial. It was an easy book to read, however it did not offer much practical advice for healthy eating. The basic premise seemed to be that if we choose good foods and eat healthy portions, our body will settle at the best weight and we must just continue to eat healthy and exercise to maintain that weight. Overall the book was ok, nonetheless I don't think I would recommend this book for someone looking for motivation to begin or maintain a healthy lifestyle, primary because it is overly simplistic and I thought some of the examples were not good models. For example, in one chapter she described a time when her husband wanted to lose some weight so he did not eat supper until he reached his goal weight and then he was careful with what he ate to maintain that weight. I don't think skipping a meal every day is the healthiest way to lose weight and is not practical for many people (myself included since I really like to eat!). Also the title seems to imply that being thin is the goal, when in reality our goal should be to live a healthy lifestyle. I did like the fact that she repeatedly emphasized that our focus should be on the Lord, not on food, and that many of the emotional and spiritual needs we try to "medicate" with food can only be healed by Him. I believe Joyce Meyer has a wonderful ministry and gifting from God, and therefore that particular focus of the book was excellent. In spite of that fact, I did not find this book overly helpful or motivating in my quest for a healthier lifestyle. 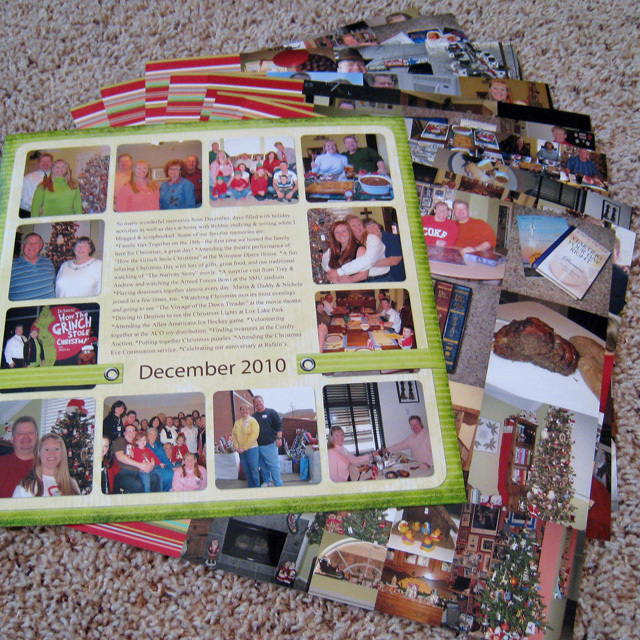 Completed several Christmas scrapping projects this week. First is my December mini-album created using the photo collages and paragraph descriptions for each day from my daily blog posts. 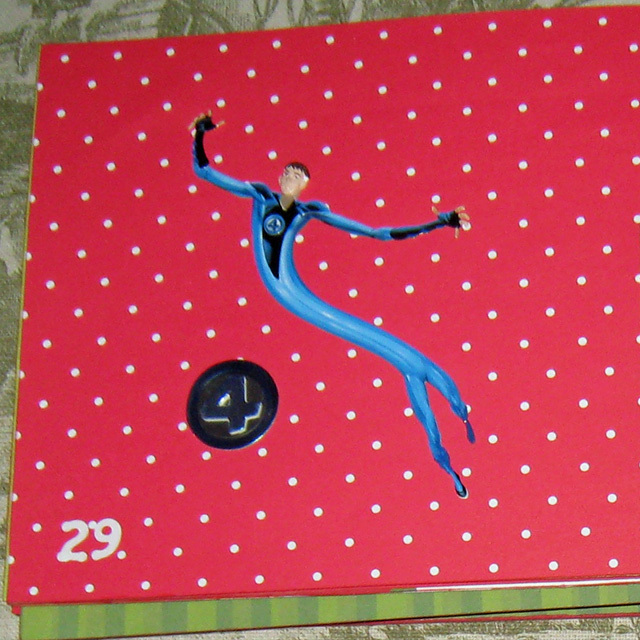 Here's a look at the completed album; the pages are 12x6 and I used binder clips to bind it together. I printed the first photo collages and started the album in mid-December (you can see some of my pages here). 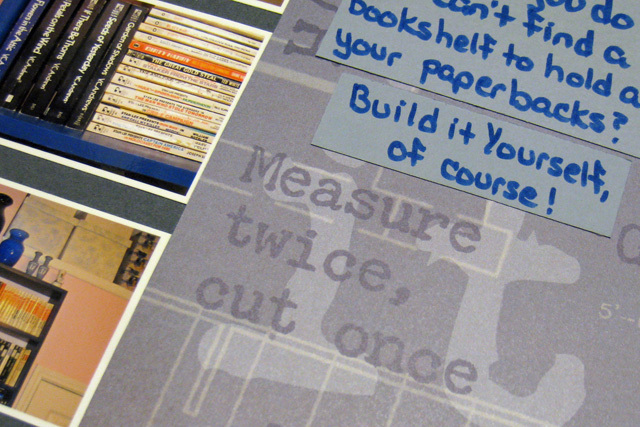 Assembling the album went fairly quickly once I had printed, cut and inked my journaling paragraphs. I adhered patterned paper to the back of each printed photo collage page, then added the date with number stickers, the journal box, and one embellishment item. Most of the embellishment items were the fronts of Christmas cards that I have saved over the past several years. Here are a couple of examples. I am so excited to use these card fronts that have been in my stash for a while, just waiting for the right project. Here's one of my favorite card fronts. There were a few pages where I used different embellishments to reflect something about the day, like these two examples. 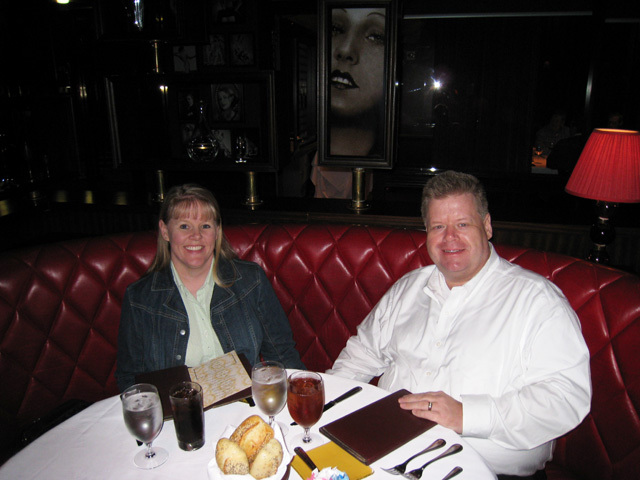 The first is the day we watched the Fantastic Four movie and the other was our anniversary. 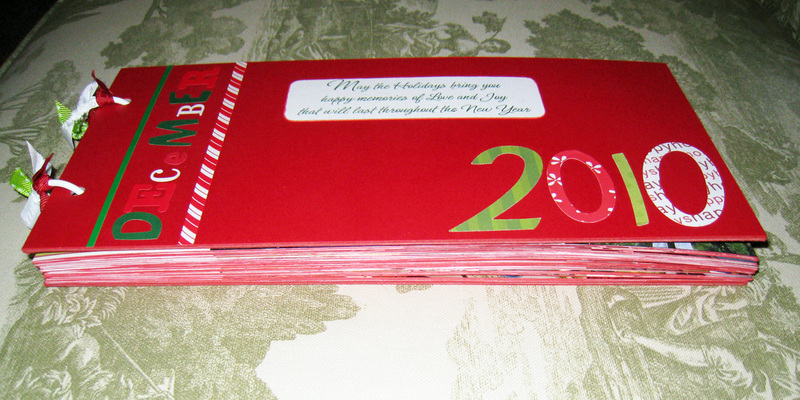 My second project of the week also involved Christmas cards, this time it was the cards we received this year. 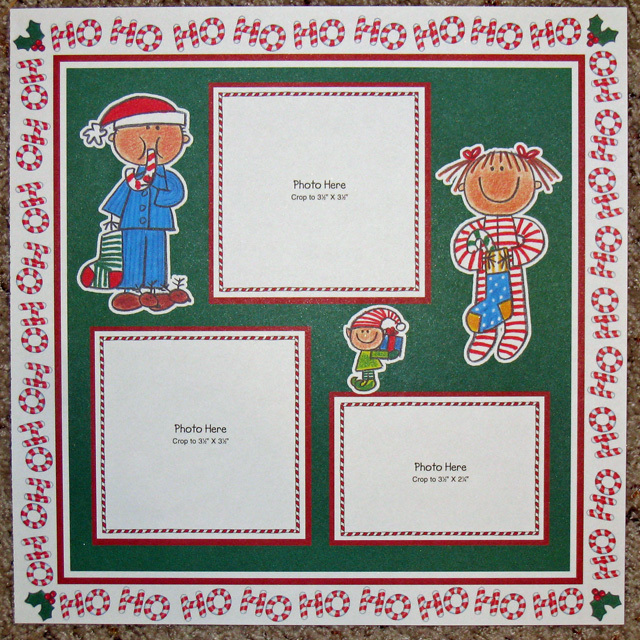 I've seen quite a few ideas for using Christmas cards on scrapbook layouts. My favorite idea is to use a square punch to save parts of the cards and use them on a layout. I saw this idea last year and am pretty sure it was credited to Ali Edwards. 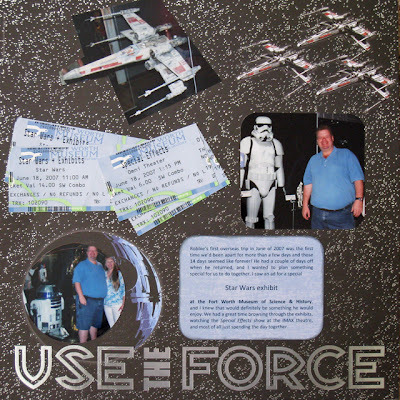 She has several examples in her scrapbook layout portfolio. (I almost got distracted from my Christmas scrapping just scrolling through that gallery of inspiration!) 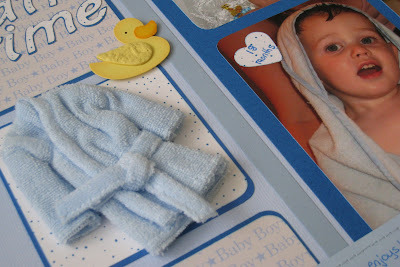 Recently I have enjoyed Sue's layout and Cheri's layout, both of which use the square punch idea. I started with a Christmas themed paper that's been in my stash for at least five years. I knew I wouldn't use this pre-printed layout, however I really liked the border so I decided to cover the middle with cardstock and use that as my base for the Christmas cards. Here's my layout with cards and photos from 2010. 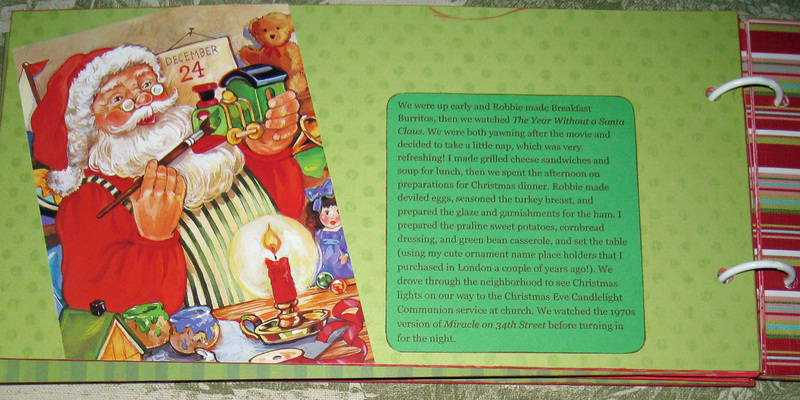 And one more Christmas layout, this one highlighting our Christmas decorations from 2007. 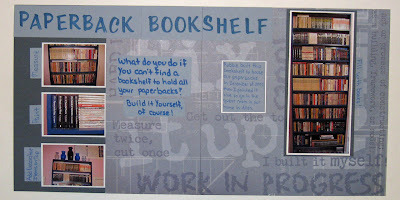 I totally scraplifted the idea, the title, and the layout design from this post by S on her blog Snaps and Snippets. Anyone else still working on Christmas layouts? I think I'm done for now, however I did order prints (and a couple of enlargements) of some of my favorite photos from December that will likely crop up in layouts from time to time. 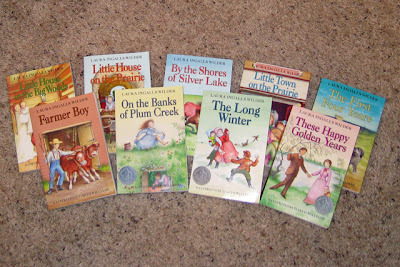 I've read all nine of the Little House books before, but I truly enjoyed reading through all nine books again these past couple of months. 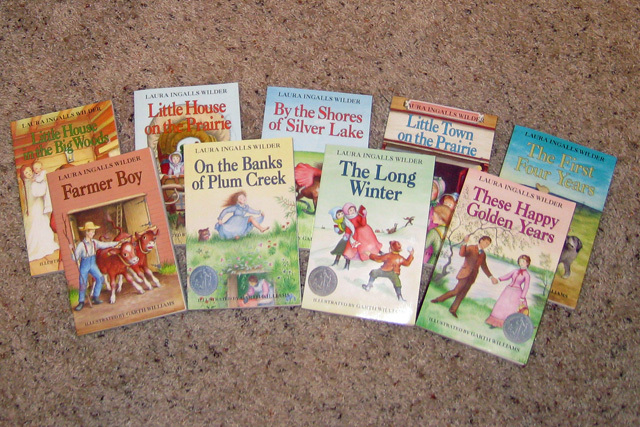 These books about the life of Laura Ingalls Wilder are some of my favorites. I enjoy reading about the pioneer life and am amazed at all the work that had to be done just to live and survive. 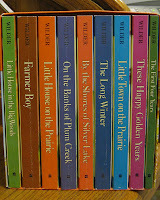 There are so many wonderful stories in these books, and I have many favorites. In By the Shores of Silver Lake , Laura shares about watching the preparation of the land for a new railroad out west. At that time, the only way to travel out west was by horse or wagon. It was truly an amazing amout of work that went into the building of the railroad. It made me think of our interstate system and many of the modes of transportation that we take for granted today, even "travel" through cyberspace. Much work went into these conveniences. Another favorite is in These Happy Golden Years when Laura discovers that not all families are like hers. She realizes that she has a wonderful family and aches to be at home where there is love and happiness. She comes to truly appreciate the family life that Ma and Pa provided. These are just a couple of things that stood out to me as I read through the series this time. 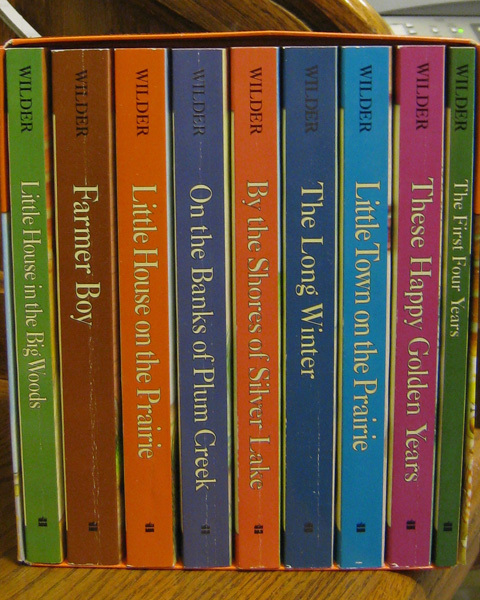 If you have never taken time to read this series, I strongly encourage you to add it to your reading list this year. At any age, these books will remind you of the importance of family, hard work, perseverance and the struggles of those individuals who helped to build our great country. A week ago Saturday, we spent many hours sorting through photo slides from Robbie's parents and grandparents. 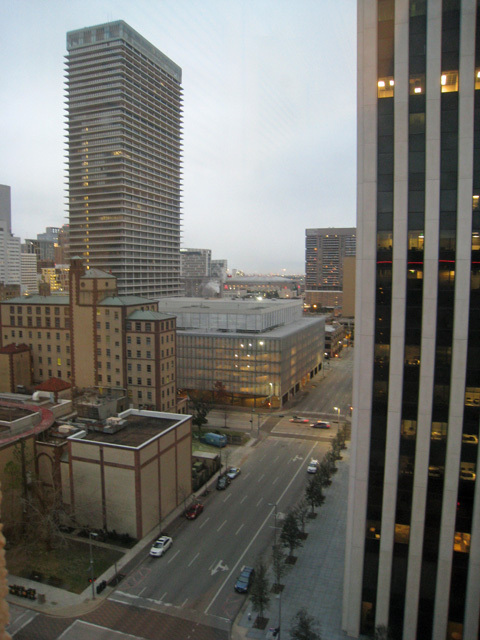 This past Saturday, I sorted through our digital photos from December, and I was struck by the differences and similarities between the two activities. We had three boxes of photo slides; we estimated about 5,000 slides. Of all those slides, one set of 36 slides was marked with the place and content of the photos. Only 36 slides out of 5000!!! Luckily, when the slides were printed, they were date stamped with the month and year. The slides we processed were from 1959 through the early 1980s. Our goal was to choose the slides we would eventually like to digitize in order to enjoy the photos in slideshows, photo albums and/or scrapbooks. In contrast, to sort my December digital photos, I simply uploaded them to my computer and was able to view the entire month in Photoshop Elements. Each photo was already stamped with the date and time from my camera. We eventually ended up with about 1500 slides that we want to keep. ﻿I labeled sticky notes with each year and sorted the slides into piles on the dining room table. 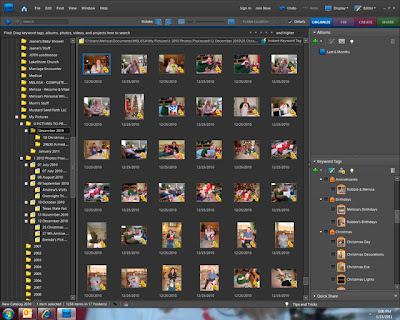 I sort my digital photos by year as well, however there's no need for sticky notes or a table. 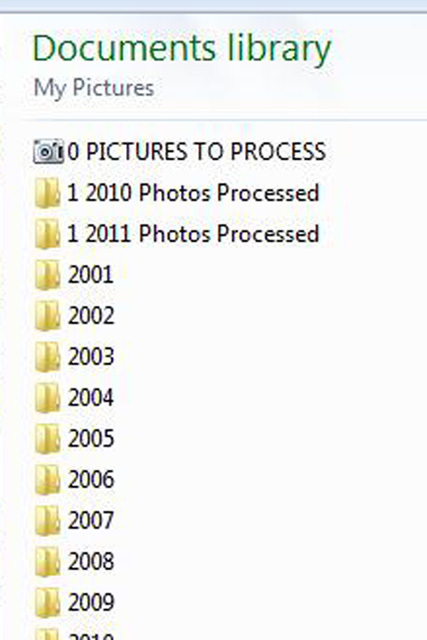 As for the digital files, there were also many photos I chose not to keep because they were blurry or duplicates﻿. Those simply went away into the digital trash can. There's still much processing to do before the photo slides make their way into a scrapbook or photo album, however I am excited that we reduced three boxes of "not-sure-exactly-what's-in-there" slides down to one box of slides that will help document Robbie's stories. 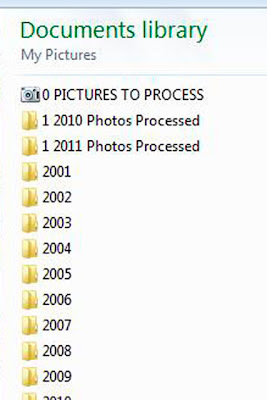 For now, I have them all sorted by year and stored with my other Project-to-Do. The digital photos for December have been tagged and rated in Photoshop Elements, the highlights uploaded to Shutterfly, and prints will be on the way here soon. It's amazing how photography and technology and the way we view our photos has changed in a relatively short period of time (50 years). I have to admit that I enjoy my digital camera that allows me to instantly see whether or not I captured the moment, but it was fun to spend a day sorting through the old slides with Robbie reminiscing about his childhood. *We've had some cold gray days here which always seem to blah me out, where is the sunshine? *I needed some time with no schedule or responsibilities after the busy holiday season. *I'll get back on track tomorrow. *On January 3 I tried a new strength training routine that left me very sore and somewhat discouraged, although in retrospect I should have felt elated that I was able to complete the routine. Whatever you do when faced with an obstacle to your wellness lifestyle, don’t panic. You haven’t failed. Remember this isn’t a diet that lasts for four weeks or eight weeks. This is a plan for you to transform your lifestyle forever. So if you don’t make the best choices today, vow to make better choices tomorrow. So, I'm resolving today to do better in the coming week. In fact, I made myself complete a 30 minute ride on the stationary bike before I allowed time to work on this post! This week in the Wellness Journey workshop, we were also encouraged to create a list of rewards as we work toward our healthy lifestyle goals. At the end of 2009, I had my first ever full-body luxury massage and it was WONDERFUL. I told myself then that when I lost down to 160 pounds, I would have a massage as a reward and then set a new goal for myself. As some of you know, I didn't really get serious about changing my lifestyle until September of 2010. In spite of my late start, I did reach my goal in late November. However I didn't reward myself with a massage because I didn't feel the need for it and I wanted to spend the money on Christmas instead. Over the holidays, my weight fluctuated right around the 160 mark, a little up or down each week. I am totally excited that I've maintained what I've accomplished and have decided it is time for that massage as a reminder of what I've accomplished so far and an encouragement to continue toward my goal of a healthier me. I've been a little reluctant until now to put my actual weight out there; I'm not really sure why but it seems the number on the scale is a one of those big secrets we keep. 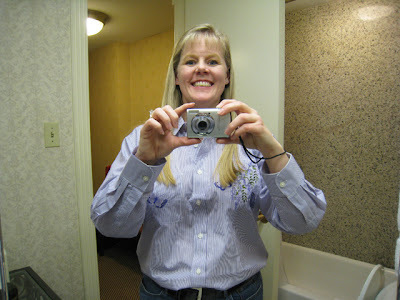 However, I've been encouraged reading Cathy Zielske's Move More Eat Less posts and Cheri's Fitness Friday posts where they reveal their weight in an effort to motivate themselves and others. While I'm enjoying my massage this week, I'll be planning my next goal and reward which I'll share in next week's post. No, I don't have the blues. In fact, I'm having lots of fun in my warm craft room while the snow outside slowly melts. I've been busy making blue layouts! It's all my sister's fault - this year she decided to start her own blog, Crazy Quilting Mom. 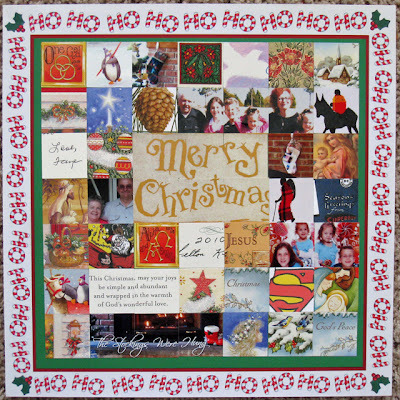 I won't comment on the Crazy part (LOL), however Brenda is a very talented quilter and the mom of all those precious nieces and nephews you see featured in my layouts. She's participating in a Rainbow Scrap Challenge each month with other quilters who are putting their fabric scraps to good use, and (you guessed it) January's color is blue. 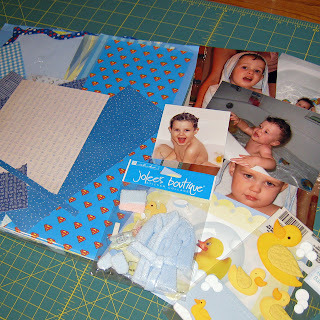 I thought I could partner with her on the blue challenge by organizing and using some of my blue scrapbooking supplies. As I was flipping through my storage binders for inspiration, I realized I had several photos of Andrew enjoying his bath time over the past three years. I pulled those photos, my blue scrap file, and two packages of dimensional embellishments that I had bought (a year and a half ago!) to create a layout. 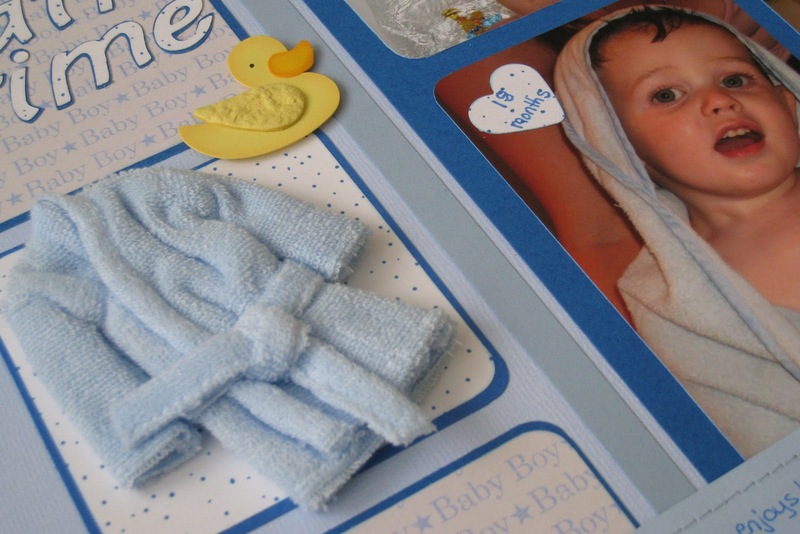 I have enjoyed making this type of "connections layout" (where photos from different years are connected together) since taking the Library of Memories workshop last year. Before LOM I would have used these photos on separate layouts for each year, however here you can see the changes in Andrew as he grows yet the sameness of his joy in bath time. 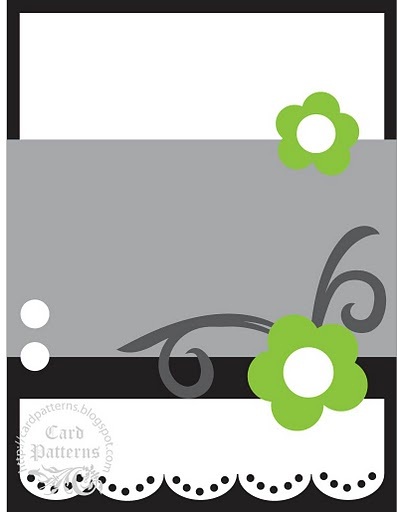 ﻿This layout will go in our Family & Friends LOM album. 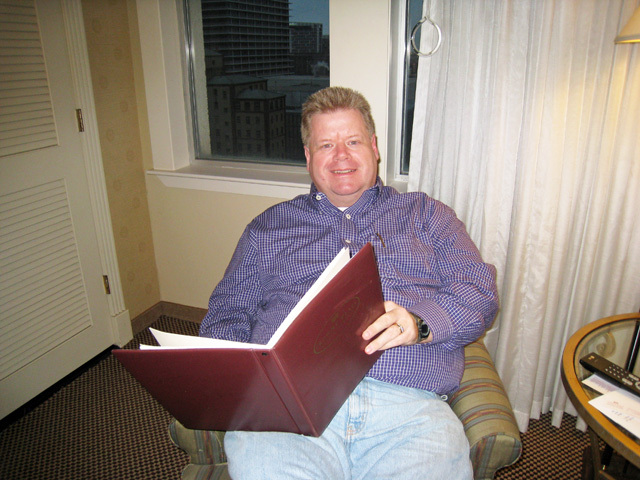 Journaling reads: Andrew always enjoys his bath when he's visiting and only fusses when it's time to get out. 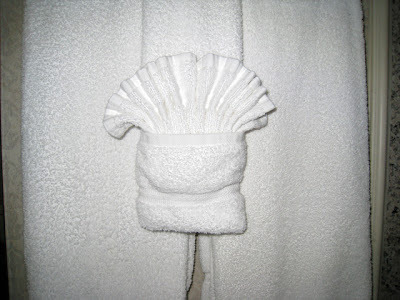 And here's a close-up of that cute blue robe embellishment. 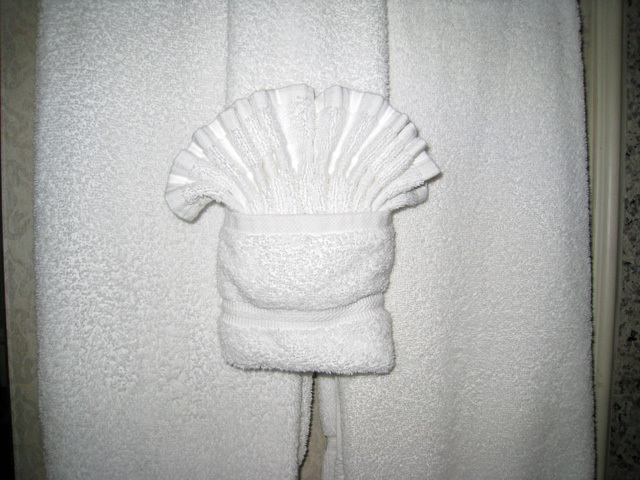 I picked it up right after the visit in 2009 when I snapped the photo of Andrew wrapped in his blue towel. From my 2007 storage binder, I pulled photos from our outing to see the Star Wars exhibit at the Fort Worth Museum of Science & History. Earlier this year, I had purchased some special Star Wars papers (which I remembered were blue). I had originally planned to just do a two-page layout, however I ended up with three pages. 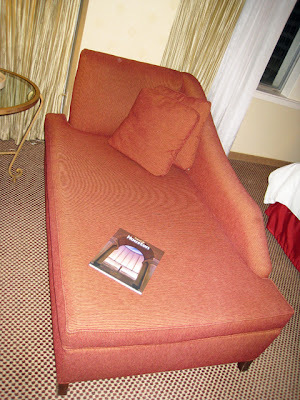 The first page tells why/how we ended up going to the exhibit and will go in our All About Us LOM album. 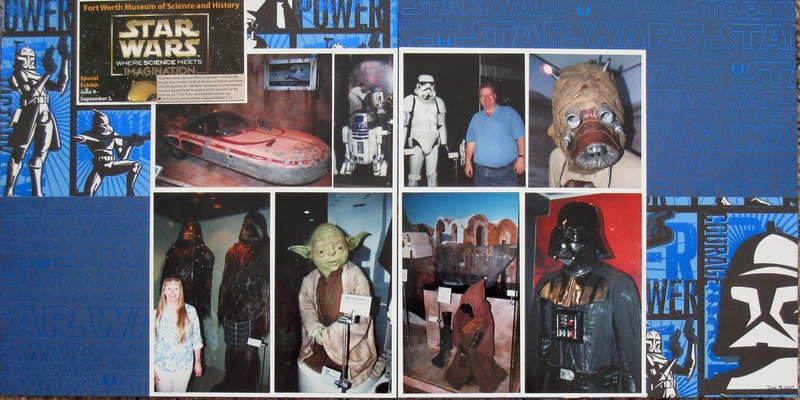 The two-page spread highlights photos from the exhibit as well as the awesome Star Wars scrapbooking papers. This layout will go in our Places We've Been LOM album. I'm enjoying the blue layouts and am planning on pulling out my blue bin today to see what inspiration might be hiding inside! Anyone else want to join me and create a few January Blues layouts? Yesterday I discovered two pieces of Happy Mail in my mailbox. 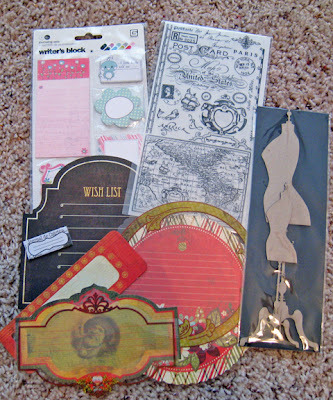 Another package contained these scrapbooking goodies from Nic Howard. I was one of the random drawing prize winners during the Color! or is it Colour? workshop at BPC a couple of months ago. 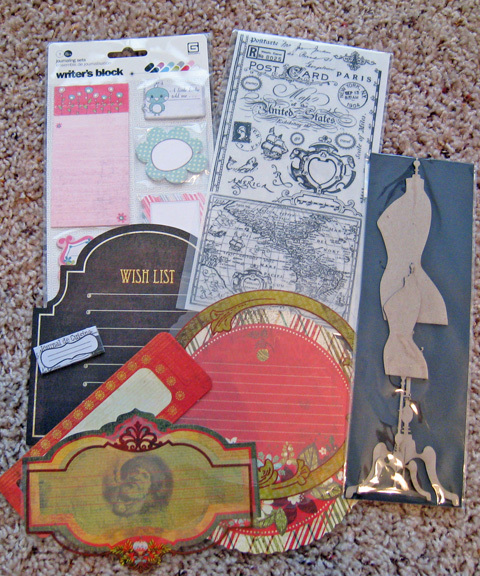 Watch for these items to appear on upcoming scrapbook layouts. 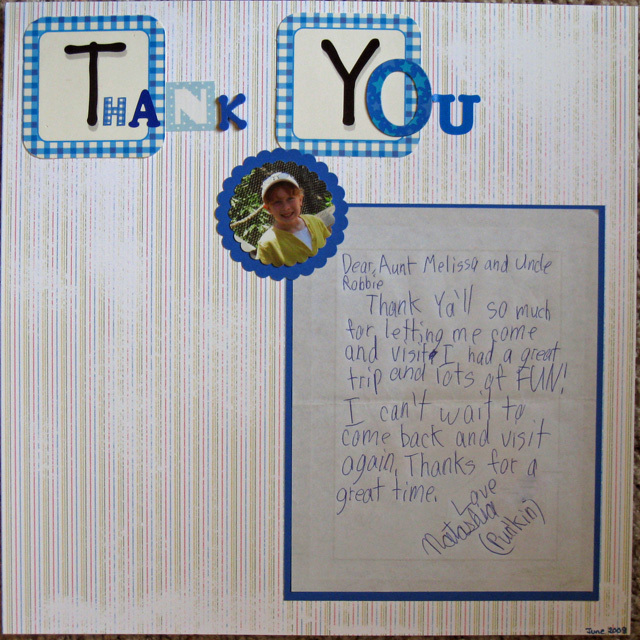 And there was a cute card from Nic - this card front just might make it onto a layout also. 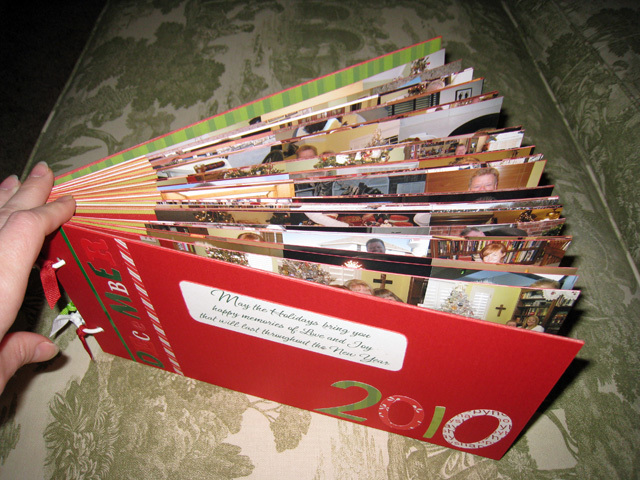 And then today, I had a very exciting surprise in my email inbox: a note from Stacy Julian letting me know that she featured my 2010 Scrapbooking Revolution layout in her blog post about the 2011 LOM Workshop coming up this summer at BPC!